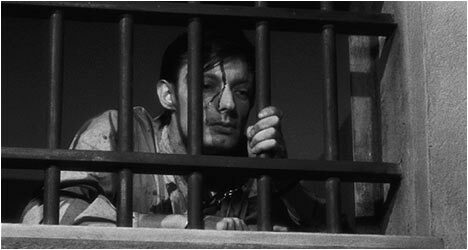 Inspired by the experiences of Andre Devigny, a French lieutenant in World War II who managed to escape from Fort Montluc prison in German-occupied Lyon in 1943, Robert Bresson’s A Man Escaped (1956) is regarded as one of the best prison-break films ever committed to celluloid. Bresson identified personally with Devigny’s story, having experienced first-hand the way the Germans treated prisoners during the war. He based his screenplay on Devigny’s account, “The Lessons of Strength: A Man Condemned to Death Has Escaped,” and even hired him on as a factual adviser. The end result is an absorbing account of how one man defied the odds. Fontaine (Leterrier) enters prison bloody and beaten having tried to escape on the car ride there. Handcuffed, he’s dragged unceremoniously and deposited in his cell. He checks himself out and says in voiceover narration, “While waiting in the courtyard, I’d gotten used to the idea of death.” It’s a grim assessment of his lot in life and gives an early indication that Bresson’s film will not try to romanticize its subject, but present it as objectively as possible. Fontaine is beaten by his jailers and lives in a Spartan cell, which allows him to spend every waking moment devising a plan to escape without any distractions. With the help of fellow inmates, Fontaine is able to get word of his situation to fellow collaborators on the outside. He endures horrible conditions with quiet dignity and a determination to get out. He does not go it alone and is in fact aided by several other inmates all of whom communicate subtly with each other so that their German captors do not catch on. In turn, he bolsters their spirits. Francois Leterrier uses his expressive face to convey what his character is feeling in a film where most of the dialogue is conveyed via voiceover narration. This allows us access to his innermost thoughts, providing insight into his motivations. The actor also uses his body language to convey Fontaine’s feelings in very economical fashion that is quite impressive considering that Leterrier had no formal training as an actor. Bresson depicts Fontaine’s methodical process of orchestrating his own escape in matter-of-fact fashion devoid of unnecessary stylistic embellishment. The stark black and white cinematography also contributes to the authenticity of A Man Escaped. Fontaine’s dedication to spending every waking moment of every day thinking about and actively working on a way to escape is very impressive. Instead of simply giving up and accepting his lot in life, he focuses on a goal and never loses sight of it. The second disc starts off with “Bresson: Without A Trace,” a 1965 interview the filmmaker did on French television. It’s a lengthy, in-depth look at his career. He also espouses his personal philosophy of filmmaking. “The Road to Bresson” is a 56-minute documentary from 1984 that acts as a primer on the directors’ style and technique with the likes of Louis Malle, Paul Schrader, Andrei Tarkovsky and Orson Welles speaking highly of the man. “The Essence of Forms” is a 45-minute documentary from 2010 that includes interviews with several collaborators and admirers. They offer their impressions and opinions of Bresson and his films. They paint a portrait of an uncompromising artist who didn’t like watching other films. Finally, there is “Functions of Film Sound,” a visual essay on the use of sound in A Man Escaped. It analyzes the variety of sound techniques and its function in the film. At times, the sound dominates the image for Bresson believed that it was just as cinematic as the images.